As DB’s Jim Reid says this morning, “Welcome to Friday 13th. As everything is so calm and stable in the world at the moment what could possibly go wrong today?” As of this moment, not much judging by the solid bid in overnight markets. … and global markets modestly in the green. European equities trade modestly higher (Stoxx 600 +0.3%), reading a six-week high with builders and miners leading the gains to a third-straight weekly gain, largely due to the US (at the time of writing) having taken no decision on what (if any) military action should be taken on Syria with today’s light calendar also failing to provide any major impetus for stocks. The bullish cash has gotten a boost from trade-sensitive sectors in Europe after Trump expressed optimism on a deal with China and after reports late Thursday he was considering rejoining the TPP pact. 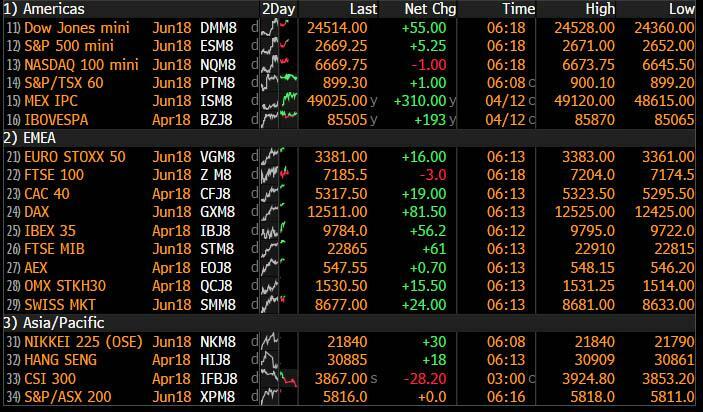 Moves have largely been noted in individual stock rather than broader-based macro ones with equities resilient against new Russian sanctions vs. the US. Individual movers include Sage Group (-13%) after cutting guidance, Hammerson (-12%) are also lower after Klepierre’s (+1%) withdrawal of their acquisition offer. Finally, Volkswagen shares up 1.0% after their current CEO is to be replaced by Diess, who will be responsible for group research. Earlier in the session, Asian equities were broadly higher as the region took its cues from the US, where sentiment was underpinned after US President Trump tweets further alleviated fears of an imminent strike on Syria. This resulted to firm gains across all US major indices, while the financial sector outperformed as yields rose in the wake of the recent hawkish FOMC minutes. As such ASX 200 (+0.3%) and Nikkei 225 (+0.6%) were positive with Australian financials mostly kept afloat following an upbeat Financial Stability Review, while Japan benefitted from the weaker currency-heightened risk dynamic. Elsewhere, Hang Seng (Unch.) and Shanghai Comp. (-0.4%) were underpinned at the open but then pared gains as the risk tone deteriorated following disappointing Chinese trade data and a CNY 100bln net weekly drain by the PBoC, while the White House was also reported to be planning to escalate trade pressure on China. The dollar weakened as Treasury yields dipped after rising above 2.8 percent Thursday. In commodities, crude oil climbed to a three-year peak after the International Energy Agency said a global glut that weighed on prices is close to being cleared. The commodity extended a rally sparked by escalating tensions in the Middle East. Aluminum headed for its biggest weekly increase since at least 1987 on concern U.S. sanctions on Russia’s United Co. Rusal will disrupt supplies. Copper, zinc, and nickel also gained, along with gold. In the latest trade war news, the White House is planning to increase trade pressure on China, according to reports in WSJ, additionally US Trade Representative will detail list of goods as early as next week that may be subject to 25% tariffs as part of possible USD 100bln of additional tariffs on China, according to reports in WSJ. Russian lawmakers have drafted legislation for sanctions on US goods including Tobacco, agriculture, medicine, and consultancy. 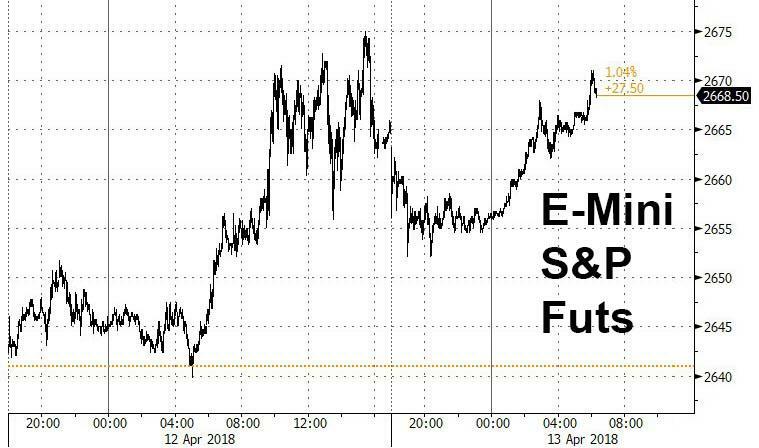 US equity futures held strong on this news. In geopolitical developments, UK PM May and US President Trump spoke on Thursday and agreed it was vital to deter the further use by Syrian government of chemicals weapons, say that chemical weapons use must not go unchallenged. As we also noted overnight, there have been unconfirmed reports US President Trump put off his final decision regarding strikes on Syria after meeting with security advisers, amid internal conflict with US Secretary of Defense Mattis and National Security Adviser Bolton.